Oil prices fell drastically on Friday on the back of news that Russia and Saudi Arabia are considering an increase in their oil production, bringing an end to the production cut deal in its current form. Oil prices plunged in early trading on Friday on news that OPEC and its partners, including Russia, are considering a loosening of their production limits (more below). Both WTI and Brent fell by more than 3 percent Friday morning. OPEC and Russia could raise production. 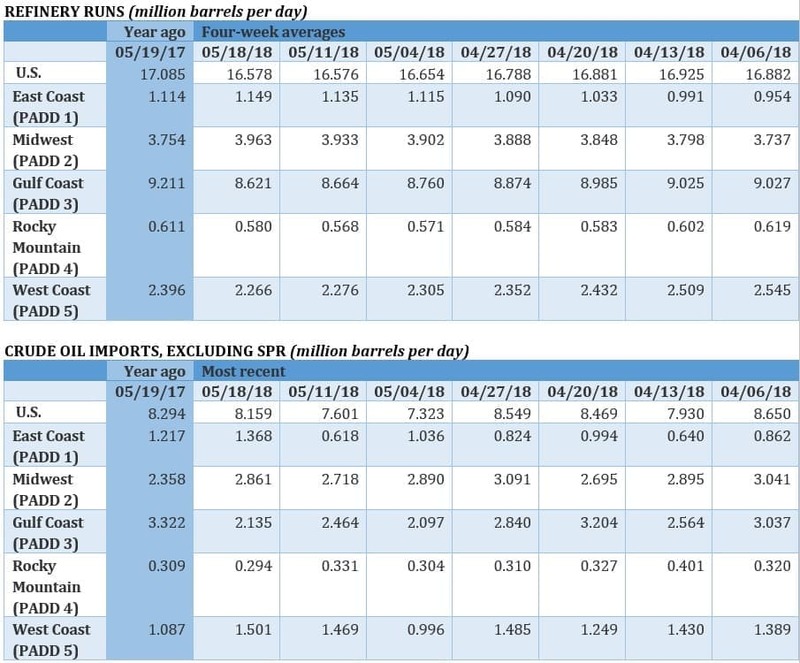 Saudi Arabia and Russia are in discussions about raising their production limits, perhaps adding as much as 1 million barrels per day to the market. The group could announce a change in Vienna next month. The steep losses from Venezuela meant that OPEC’s compliance with the cuts surpassed 150 percent last month. The idea would be to bring compliance back down to 100 percent, which would mean allowing members to produce more to offset Venezuela’s declines. Nothing is finalized yet and the talks will continue for the next few weeks. Oil prices sank on the news. U.S. oil exports rising, but infrastructure faces constraints. 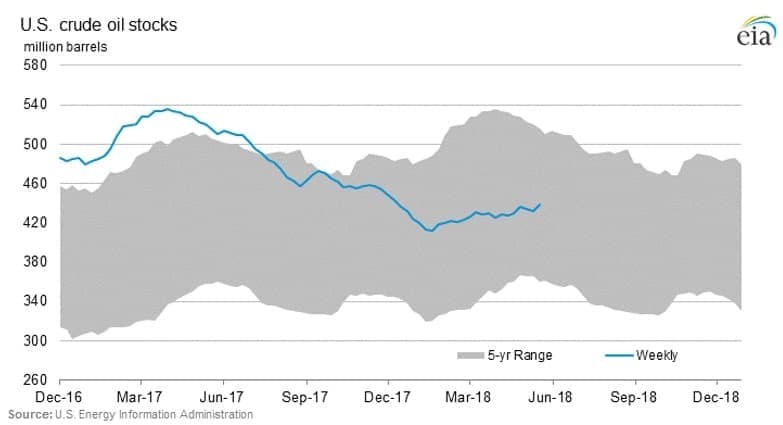 U.S. oil exports hit a new record at 2.6 million barrels per day two weeks ago, but have dipped since then. 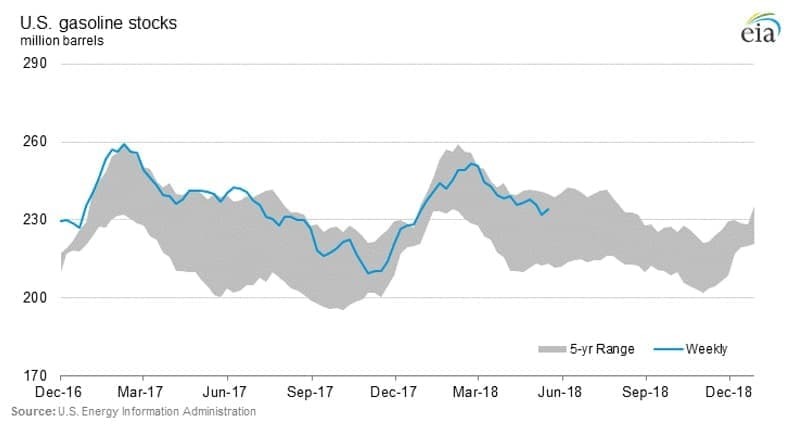 Most analysts see exports continuing to rise, particularly with WTI trading at a steep $8-per-barrel discount relative to Brent. However, there are concerns that U.S. port infrastructure won’t be able to handle much higher levels of exports. Export capacity data isn’t tracked and the exact capacity is not known, although it is thought to be around 3.5 mb/d. As of now, the Louisiana Offshore Oil Port (LOOP) is the only Gulf Coast port that can handle very large crude carriers (VLCCs). “So far, export capacity is keeping pace, but we are walking a tightrope,” Bernadette Johnson, vice president at DrillingInfo, told Reuters. 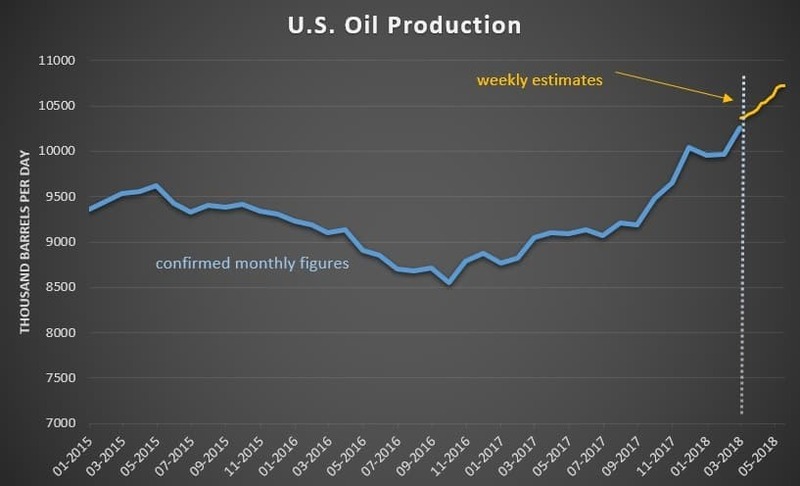 U.S. shale growth to disappoint. Industry veteran Mark Papa, CEO of Centennial Resource Development (NASDAQ: CDEV) and former head of EOG Resources (NYSE: EOG), says that the growth projections for U.S. shale are overly optimistic. Papa says growth disappointed last year and would continue to undershoot expectations, largely because the best sites have already been drilled. In the Eagle Ford and the Bakken “my estimate is that about 70% of the good quality drilling locations have already been drilled," Papa said, according to S&P Global Platts. "So you're left ... with Tier 2 and Tier 3 quality geologic locations and there's a really steep drop-off in the amount of oil you get per well with those locations." Peak oil demand to erase $19 trillion in oil income. The adoption of 240 million electric vehicles by 2040 will cause oil demand to peak by the mid-2020s, which will destroy $19 trillion in income, according to Aurora Energy Research Ltd. Aurora’s “analysis points to a possible energy future of mass electrification, digitization, and new technologies, in which the rise in electric vehicles and continued improvements in fuel efficiency lead to peak oil demand occurring in the mid-2020,” Richard Howard, head of research at Aurora, said in the report. Ultimately, the displacement of around 8 million barrels per day could cause oil prices to fall to as low as $32 per barrel by 2040. NJ bails out nukes. New Jersey approved a bailout of its struggling nuclear power plants. Ratepayers will essentially subsidize the nuclear plants, operated by Exelon Corp. (NYSE: EXC), by about $300 million a year. The support for nuclear comes after New York and Illinois previously passed similar measures to rescue their nuclear power plants. Large consumers step up oil hedging. With Brent oil near $80 per barrel, large industrial consumers, such as airlines and shipping companies, have increased their hedges, locking in oil for the next year or so, fearful of further price increases. “Consumers are hedging, which is supporting the back end of the Brent curve,” Thibaut Remoundos, founder of Commodities Trading Corp., told Bloomberg. UBS: $100 oil possible. Investment bank UBS says that a price spike to $100 per barrel is possible, which should be worrying because it could trigger an economic recession. “Now that we are getting closer to $100/bbl the net impact of higher oil prices is again becoming a net negative," UBS said in a research note. "The global sweet spot — where oil prices may have positively contributed to global growth — seems to be somewhere between $50/bbl and $70/bbl." ExxonMobil to slash methane by 15 percent. ExxonMobil (NYSE: XOM) said that it would voluntarily cut methane emissions by 15 percent by 2020 in an effort to reduce its impact on climate change. More and more oil companies are offering voluntary cuts to head off regulatory action. EU settles antitrust case with Gazprom. The European Union officially settled a suit this week against Russian gas giant Gazprom, filed back in 2015, over anticompetitive behavior. Last year, Gazprom accepted changes to the way it conducts business in the EU, including allowing for the reselling of gas across borders and changes to pricing that will prevent the company from gouging individual countries who lack alternative supplies. “Gazprom won’t be able to play hardball,” Jonathan Stern, an analyst in the gas program at the Oxford Institute for Energy Studies, told the New York Times. Still, countries in Eastern Europe believe Gazprom got off easy. Canadian oil exports to U.S. Gulf Coast surpass Venezuela’s share. Canada has long supplied the U.S. Midwest with heavy oil, but more Canadian oil is heading to the Gulf Coast. Canada’s oil exports to the U.S Gulf Coast topped that of Venezuela for the first time on a monthly basis. Both countries ship heavy oil to Gulf Coast refiners, but Venezuela’s losses mean that Canadian oil has become more important. The Saudis/Russians may sadly not be as dumb as I thought. I bought all the reports that the Saudi's wanted $85 to $100 a barrel gas w Russia willing to go along. I was counting on oil in that range to keep U.S. shale oil on fire, and spur offshore drilling greatly increasing supply while at the same time making renewables competitive and able to gain market share rapidly while they continue to lower costs. 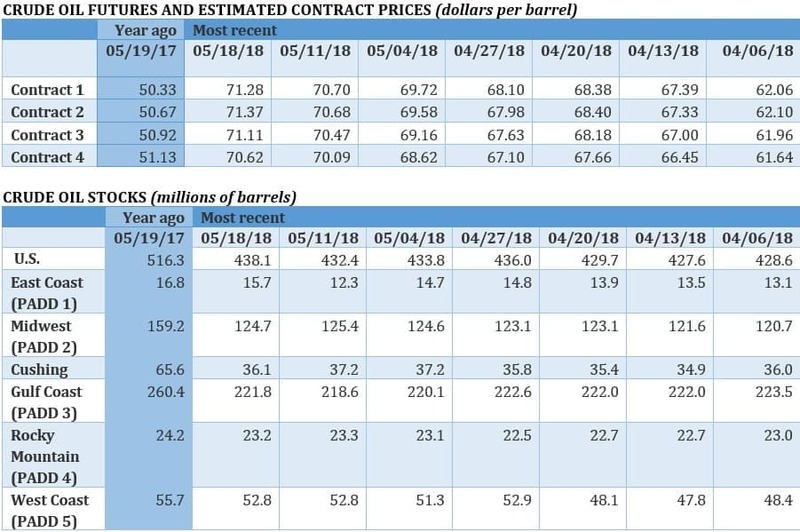 It now seems possible Saudi Arabia and Russia know oil between $50 and $70 is the sweet spot that maximizes their revenues medium and long term. The USA gasoline needs to be developed to be of one grade for all gasoline vehicles--one year-round grade. Its price should never exceed two dollars a gallon. This would stable the falling petroleum industry which is being displaced by electronics. Always great selection of articles by Tom. Not sure if in 2040 oil drillers will be drilling for free, never pays well, but I'm sure the research group prediction of $32 considering inflation of everything else in 30 years is not a horse I would bet on. Even the production of the hundreds of products that use oil in them would cease as oil drillers realize more profit is made picking up bottles along the highway. Saudi Arabia can still bring prices down. It was not affected by the war, so that Syria and Iraq has more reason to bring prices up. However, the old high prices ($80/bbl) it enjoyed also gave them extra money to buy weapons of mass destruction. Furthermore, Saudi Arabia's support of ISIS was betrayed by its tolerance of ISIS selling up to as low as $14/bbl, $6 below its break-even. i think oil might crash soon to $50. The current oil price above $70 already too high, too high will cause an economic crisis. those who enter at $70 might at risk.